Guadeloupe weather is nice, sunny and warm throughout most of the year, making it a great place for people who like a warm weather Guadeloupe to take a vacation on this Caribbean island. The current weather in Guadeloupe is shown below. It is subtropical weather in Guadeloupe, tempered by trade winds, along with moderately high humidity. The overall temperature on the coastal areas of the various islands tends to average between 76 and 82°F (24.4 to 27.8°C) throughout the year. Venturing further inland; however, the temperatures are quite cooler, and average from about 66 to 81°F (18.9 to 27.2°C). 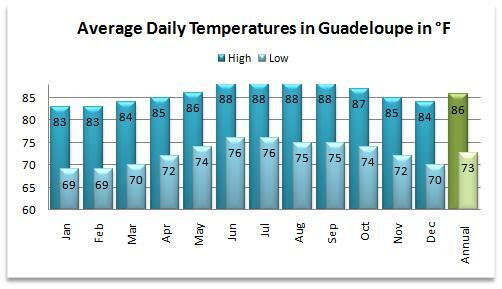 The winter time average high temperature in Guadeloupe is around 83°F (28.3°C), with the winter time low average is approximately 69°F (20.6°C). Summertime temperatures are just a little higher, with an average high temperature close to 87°F (30.6°C), and with the average low near 76°F (24.4°C). The highest temperature ever recorded in Guadeloupe was 102°F (38.9°C), on a sweltering August day. The record low temperature of a cold 59°F (15°C) happened on a (very) chilly January night. There are only two different seasons for the Caribbean islands that make up the country of Guadeloupe. These seasons in Guadeloupe weather consist of the wet season and the dry season. While precipitation usually occurs evenly over the entire year, the traditional dry season in Guadeloupe lasts from December through May. The rainy season, on the other hand lasts from June through November, and coincides with the hurricane season. During the rainy season, the rainfall averages about 16.4 to 17.6 inches per month. Humidity reaches about 77% in both March and April during the dry season, and goes up to approximately 85% in October (the wet season). Year round, you can expect between 18 and 27 days out of every month brings at least one rain shower, indicating that unexpected rain showers can happen at any time of the year in Guadeloupe weather. Most showers, however, do not last too long and quickly kneel to the tropical sunshine within a very few short minutes, and you are once again lying on a warm weather Guadeloupe beach. Hurricanes are more likely to occur during the month of September. Guadeloupe weather is disturbed by tropical storms about once every 3.5 years, and is only affected by a direct hurricane hit once every 15 years or so. The last major storm to hit the island was Tropical Storm Lenny on November 19th, 1999. No matter what time of year you choose, chances are good that the weather in Guadeloupe will exceed your expectations. Just be sure to check the hurricane forecast for the Guadeloupe weather if travelling in the late summer/fall.